Craig Straus was diagnosed with an acoustic neuroma after he experienced hearing loss and a loud ringing sound in one ear. MSK surgeons Samuel Selesnick and Cameron Brennan removed the noncancerous tumor, and today, Craig is getting used to a new normal with hearing loss in his left ear. He comes back to MSK once a year for an MRI. Craig Straus and sons Tyler (left) and Dylan. Craig came to MSK for surgery to remove an acoustic neuroma, which is a type of noncancerous tumor that develops in the inner ear. Photo courtesy of Craig Straus. Craig Straus was diagnosed with an acoustic neuroma in 2017. Acoustic neuroma is also called vestibular schwannoma. It is a noncancerous tumor that starts in the hearing and balance nerve that connects the ear to the brain. Craig underwent surgery to remove the acoustic neuroma with Samuel Selesnick and Cameron Brennan at MSK in February 2018. Today, Craig is getting used to a new normal with hearing loss in his left ear. He comes back to MSK once a year for an MRI. When Craig Straus, 38, started losing hearing in his left ear during the summer of 2017, he initially dismissed it as a temporary problem. He had been on multiple flights — maybe the pressure was never relieved, he thought. It was an otherwise enjoyable time of the year as Craig spent a lot of time with his wife, Lorraine, and sons Dylan, then 4, and Tyler, 7, in their backyard and pool in Kinnelon, New Jersey. But when Craig woke up on November 30, he suspected something more serious was going on. The slight hearing loss had become a very loud ringing sound overnight. “If you’ve ever been to a concert and tried to talk to someone right after, that’s what this sounded like,” he says. Craig saw an ear, nose, and throat (ENT) specialist that day who confirmed that he was losing his hearing and ordered an MRI. The ENT specialist thought Craig could have an acoustic neuroma (also called vestibular schwannoma). This type of noncancerous tumor starts in the hearing and balance nerve that connects the ear to the brain. Acoustic neuromas affect approximately one in 100,000 Americans per year, according to the National Institutes of Health. The MRI confirmed that Craig had an acoustic neuroma that was about the size of a headphone jack. Craig and Lorraine, professionals in the pharmaceutical industry, felt comfortable developing a plan and researching the experts that his ENT doctor recommended and some they found on their own. They learned he had three options. Craig could opt for a watch-and-wait strategy. He would have to accept the ringing in his ear and get an MRI every six months to monitor the tumor’s size. It would continue to grow, and eventually he’d completely lose his hearing, but the neuroma might only become a dangerous size after many years, even decades. If he wanted the tumor treated, Craig could receive radiation therapy, which successfully stops acoustic neuroma from growing approximately 90% of the time, or have surgery to remove it. Either of those treatments would also likely lead to hearing loss. From left: Lorraine, Tyler, Dylan, and Craig. Photo courtesy of Craig Straus. Craig viewed the watch-and-wait strategy as “doing nothing,” he says. As a former collegiate baseball player, he was used to feeling healthy, staying in shape, and approaching problems head-on. He was also concerned about the potential side effects that could come with radiation treatment. One person that Craig found on his own was Samuel Selesnick, a surgeon at MSK who specializes in treating neurological disorders of the ear. Dr. Selesnick is also a professor and Vice Chair of the Department of Otolaryngology at Weill Cornell Medical College. Craig was already familiar with MSK and initially thought it would be unusual to be treated at a cancer center for a noncancerous condition. Dr. Selesnick understands this sentiment. That first meeting with Dr. Selesnick was memorable for Craig. The doctor explained acoustic neuromas to Craig with a PowerPoint presentation that set a good tone for the conversation. After that, Dr. Selesnick performed a hearing test, examined Craig, and joked around, which put him at ease. A benign tumor in a bad location is a bad thing — and that's what acoustic neuromas are. Dr. Selesnick fondly remembers the initial appointment with Craig too. He says he immediately found Craig to be dynamic, curious, and intelligent. But Craig still had to decide whether to have surgery at all. While he was struggling to make a choice, he called Dr. Selesnick. “I told him, ‘I don’t know what to do. I’ve met with these experts, but I have the least medical knowledge to make this decision,’ ” Craig says. Dr. Selesnick told him that there was no wrong answer, and that he needed to consider all the information he got and select a course that felt right for him. “It was nice to hear him talk to me like a person and not like he’s a doctor,” Craig remembers. Around New Year’s Eve in 2017, Craig decided to have surgery with Dr. Selesnick at MSK. Craig had chosen his path, but he was still nervous about complications from surgery. The surgery for acoustic neuroma comes very close to the facial nerve. If that nerve is even partially injured, appearance can be altered or use of the facial muscles can be limited. Craig also learned that the operation could affect his balance. He hired a personal trainer who would hopefully speed up the recovery process and get him back on his feet. Five days before his surgery, Craig went to MSK to meet with neurosurgeon Cameron Brennan, who would be crucially involved in the operation. Dr. Brennan treats people with all types of brain tumors at MSK, whether they’re cancerous or not. Dr. Brennan explained to Craig that he would start the surgery, Dr. Selesnick and Dr. Brennan would remove the tumor together, and then Dr. Brennan would take over to finish. Craig also met neuroanesthesiologist Patrick McCormick and neurophysiologist Edward Avila before surgery. On the morning of February 9, 2018, Craig realized that he had never been in a hospital for an extended time before. Now, he was about to undergo a seven-hour brain operation. After that, Craig was ready to get started. Right before the surgery began, he had only one directive for his surgeons: Get it out. The surgery went exactly according to plan. Craig was thrilled that his appearance didn’t change. “Some people come out of surgery looking like they got beat up by Mike Tyson,” he says. His wife snapped a photo to prove to him that he looked the same as he did prior to the surgery. 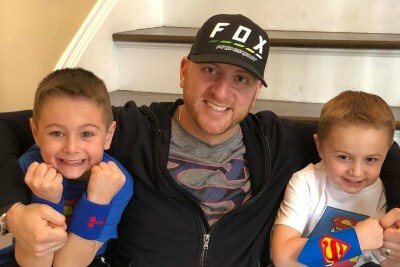 Craig went into surgery on a Friday morning and knew it was possible that he’d have to stay in the hospital for up to a week. Instead, he recovered quickly, thanks to his care team, and was released by Dr. Brennan on Monday morning. Dylan and Craig. Photo courtesy of Craig Straus. Today, Craig is getting used to a new normal. He has complete hearing loss in his left ear, but he doesn’t mind it. He comes back to MSK once a year for an MRI, and in April 2018, he was able to get back to physical activity and working out. Craig also met his first promise to his son Dylan, to throw him sky high into the water during their first pool day of the year. Craig is grateful for the lessons this event has taught him.